If you’re looking to upgrade your truck’s appearance and functionality, Pickup Truck Bed Rails are a great way to do it. Bed rails allow truck owners to easily tie down cargo in the bed area. They also help secure long or oversized items that need more reinforcement than the truck rack can provide on its own. Whether you use your truck every day to haul equipment, or you’re looking to add some style to your ride, bed rails are a good option. 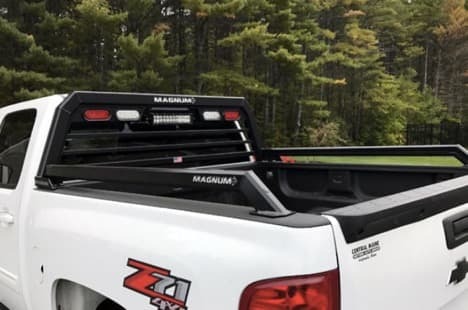 Magnum’s Pickup Truck Bed Rails are designed to protect the truck bed when hauling long or larger equipment that may extend over the side of the bed. Bed rails allow truck owners to easily tie down and secure items, which helps prevent scratches, dings or other damage to the bed. If you’re looking to hold a piece of equipment in place as you transport it, such as a motorcycle or snowmobile, bed rails allow you to secure it easily, from multiple angles. Our Pickup Truck Bed Rails were custom designed to specifically work with your front Magnum Rack. They also require absolutely no drilling to install and come complete with everything you need to get them on your truck. The interior Glide Track works with sliding D-Rings (optional) to secure your cargo and keep your load safe. Available standard with a matte black powder coated finish or in mill finish at no extra charge. Securing a common piece of equipment to your truck, such as a latter. Transporting a heavy piece of machinery in the bed of a pickup, without worrying that it may tip over or move around while the truck is moving. Protection for the side rails of your truck; no more unsightly dings, scrapes and missing pieces of paint. 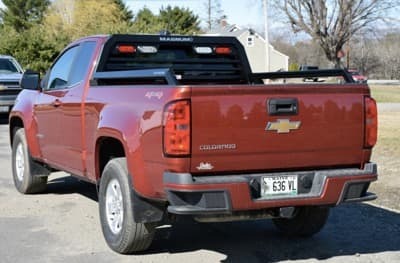 Whether your job requires you to haul bulky or oversized items every week, or you simply want to upgrade your truck’s appearance, Pickup Truck Bed Rails are a great solution. Benefits of bed rails include additional areas to tie down heavy cargo within the bed and the added security that machinery or appliances being transported in the bed is being done safely and securely. Magnum offers free shipping on bed rails within the continental United States, and includes everything you need for installation.